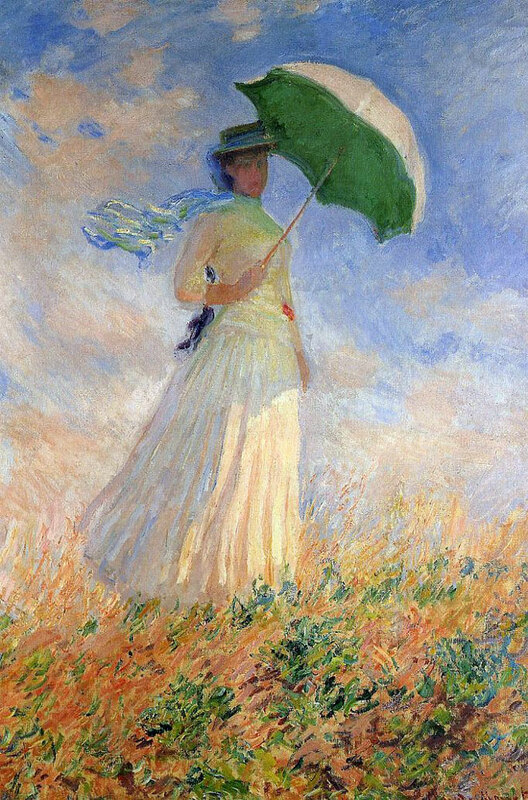 As Monet’s Woman with a Parasol, (facing right) comes into view, I see a moment in time. I see a moment of glowing harmony. I see a moment of exhilarating motion. I see life. The atmosphere of the painting is one composed of tranquility. There is a calming swirl of energy in the artwork, as the fluffy clouds in the blue sky shimmer in the invisible breeze, serenely encircling the woman with a parasol in the center. The long, continuous brushstrokes merge the ethereal, sparkling clouds together—the light (seemingly transparent), whitened hues twirling in a dance with the hues of peach. The atmosphere of the painting is one composed of movement. The woman with a parasol stands on a sprouting ground of multicolored animation. The grasses and blossoms of the land effloresce in the same invisible breeze. With rapid, shortened brushstrokes moving in different directions, with the colors of orange, green, pink, purple, and more mixing together in a conglomeration of flourishing vivacity, there is such breathtaking motion to the terrain. The atmosphere of the painting is one composed of life. The forces of tranquility and movement unite in a relationship that breathes, that radiates, that lives—the clouds of the azure and the blossoms of the land blend together, erasing any lined boundary between sky and earth. The woman with a parasol stands in this moment, in the dazzling rays of the sun. As her lightweight scarf flows amongst the clouds, as her dress mingles with the colors of nature’s terrain, she becomes one with this living atmosphere. And with a blurred, unidentifiable face, it is as if you, the viewer, are invited to become this woman with a parasol. You are invited to identify as her. You are invited to enter and experience the beauty of life.